In addition to his position with the National Arts Centre Orchestra, Mr. Zukerman chairs the Pinchas Zukerman Performance Program at the Manhattan School of Music. To maintain close relationships with his students while fulfilling the travel demands of his concert engagements, Mr. Zukerman has pioneered the use of distance-learning technology in the arts. 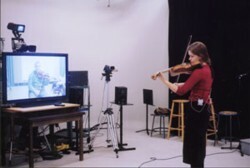 Through the use of the school’s videoconferencing system, his students are able to receive regular string instruction. Here is the best link I was able quickly to find concerning how Zukerman does this. Interestingly, he was already deep into video-conference for music teaching over a decade ago. See also this, by another violinist who more recently tried doing the same thing, and was very enthusiastic about it.